In our previous blog we listed out the issues that face the Supply Chain. In this blog we’ll go through how SAP EM can be leveraged to address these issues. How does SAP EM address the challenges mentioned in part 1 of the blog series? 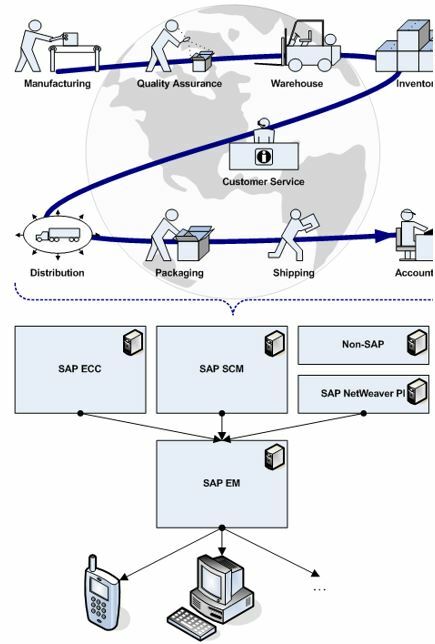 Visibility: SAP EM provides maximum visibility across the supply chain network. This visibility allows for the detection of deviations in the demand and supply of goods and services. The User Interface is a key to the success of any technical product. SAP EM provides a simple, easy-to-use web interface for reporting and capturing events. The alerts and workflows from these events can be sent to the user’s company email inbox or remain in SAP, making the product one of the most user friendly in all of the SAP suite. With SAP EM 9.2 we have the ability to create your own user interface for SAP Fiori. Tight integration between events and their schedules leads to proactive monitoring and less reacting to emergency situations. When the processes are efficiently and effectively monitored, there is no need to buffer inventory for the ‘just-in-case’ scenario. Exception Management – SAP EM stores ‘The Plan’ for the business process (when things are supposed to happen, by whom and where) and measures ‘The Plan’ against the ‘actual’ values. Exceptions to the plan are highlighted, in real-time, and can be proactively resolved whether they are exception events or delays in the expected process. Improved customer satisfaction for timely, accurate communication. SAP EM has the ability to capture exceptions around the message of an event. For example, the PGI event at 10:00 PM says the PGI occurred at 2:00 PM … the PGI event occurred on time, but the message reporting this was several hours late!!! SAP EM helps drive proactive behavior, especially in receiving timely accurate data from the organizations partners. This has a direct, positive impact with the customer. Improved processes by leveraging business intelligence derived from their actual execution. Departments and individuals can be measured against ‘The Plan’ and ultimately against their individual SLAs => bottlenecks can be identified and process deficiencies addressed. To summarize, SAP EM is used to monitor your processes, notify you of exceptions, allow you to adjust your process accordingly to gain efficiencies and minimize exceptions, and finally to analyzeyour performance to learn what is going on in order to take control of your processes.